The Red Dot is an internationally recognised award for products that feature high-quality design and optimally meet the needs of customers. 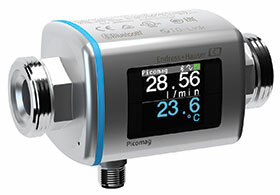 “We are pleased that the Picomag persuaded the jury with its compact format, flexible installation possibilities and intuitive operation,” said Dr Bernd-Josef Schäfer, managing director of Endress+Hauser Flowtec, the Group’s centre of competence for flow measurement technology, based in Reinach, Switzerland. Professor Dr Peter Zec, initiator and CEO of the Red Dot Award, congratulated Endress+Hauser: “The winning products are marked by outstanding functionality and an attractive appearance, which proves that the designers understood their customers.” Among other things, the products are evaluated according to the level of innovation, functionality, design quality, ergonomics and durability. A roughly 40-person jury selected the winners from 6300 objects that were submitted for consideration. In industrial process measurement and automation, demand is steadily rising for simple, reliable and maintenance-free measuring instruments in a pocket-sized format. The new Picomag from Endress+Hauser fulfils these requirements and can be deployed across all industries. It measures not only the flow in electrically conductive fluids, but also the process temperature. In addition, Picomag offers customers easy commissioning with Bluetooth using its SmartBlue App, as well as seamless system integration thanks to IO-Link technology. The Red Dot award is one of the world’s biggest design competitions. The award, which stands for outstanding design quality, is divided into three categories: product design, communications design and design concept. Winners were honoured at the beginning of July during the Red Dot Gala, held at the Opera House in Essen, Germany. All the winning innovations were displayed during a special four-week exhibition and also presented in the Red Dot Design Yearbook.